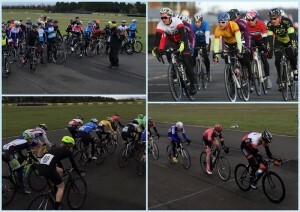 A brave duo of Harrogate Nova riders joined dozens of others at event 5 of the Velo29 Winter Series at the Croft Circuit on Saturday, hurtling round the circuit at 25mph, dealing with the strong winds. Dave Moss-Blundell placed 9th in the 4th Cat race from a field of 66 riders. Matt Dalby placed 13th (from a field of 91) in the E/1/2/3/4 race. Harry Brook-Dobson made his open TT début at the Frome & District Wheelers 10-mile TT. From a record entry of over one hundred, Harry finished a creditable 28th in a time of 23:04, having tamed the “Frome ski-slope”, and overtaken a fellow TT competitor for the first time. The U375 course near Frome in Somerset, provided riders with a stiff tailwind out, but a seemingly stiffer headwind home. Clearly his tea-shop outings with University buddy Edwyn Oliver-Evans have included some serious training efforts. Well done Harry! The weather forecast had promised some strong winds and riders taking in the fourth of the Yorkshire Magnificent Seven Reliability Rides weren’t disappointed. The 60-mile route into Wharfedale had the uncanny knack of making sure the wind was never fully behind the peloton. The outward leg (Otley-Ilkley-Addingham-Bolton Abbey-Barden Tower-Appletreewick-Hebden-Grassington-Conistone-Kettlewell) was energy sapping, straight into the 45mph wind. 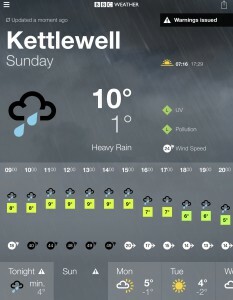 By the time the “turn” at Kettlewell had been reached, the strong gusts meant good bike handling skills were essential for the return route (Kilnsey-Thresfield-Burnsall-Bolton Abbey-Ilkley-Weston-Otley). Ride 5, the Alex Warburton Memorial Ride, organised by Alba Rosa, takes place on Sunday 28 February 2016, leaving The Lawnswood Arms at 9:30am.